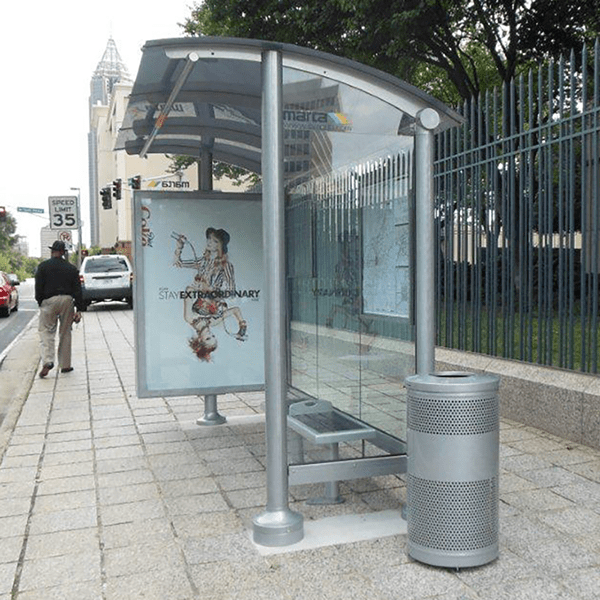 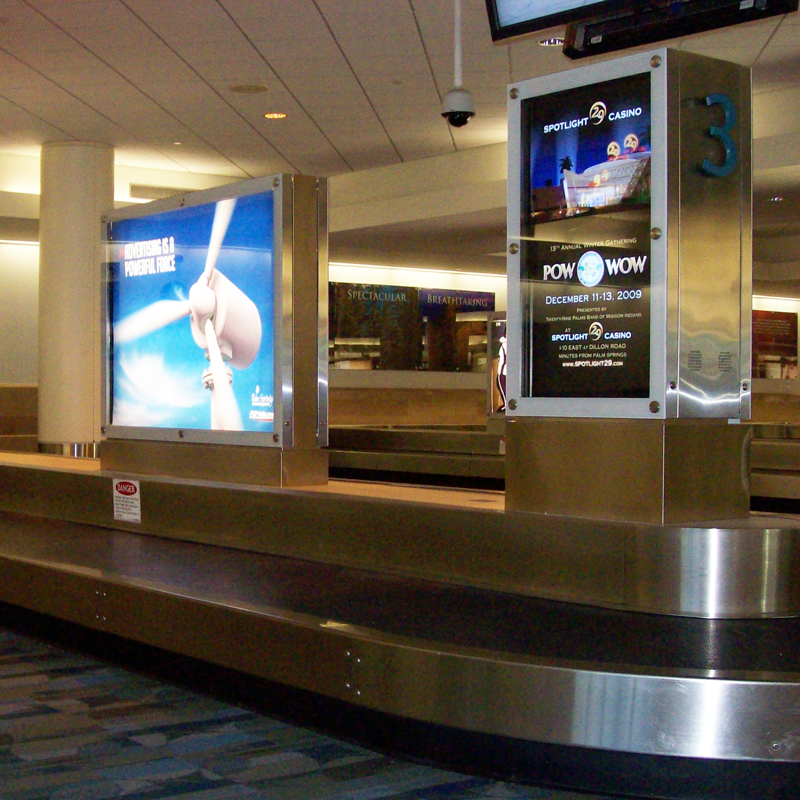 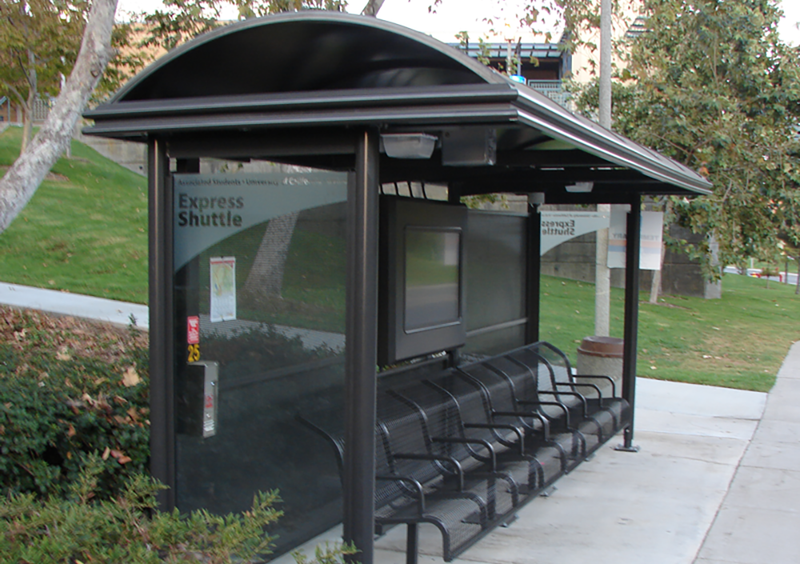 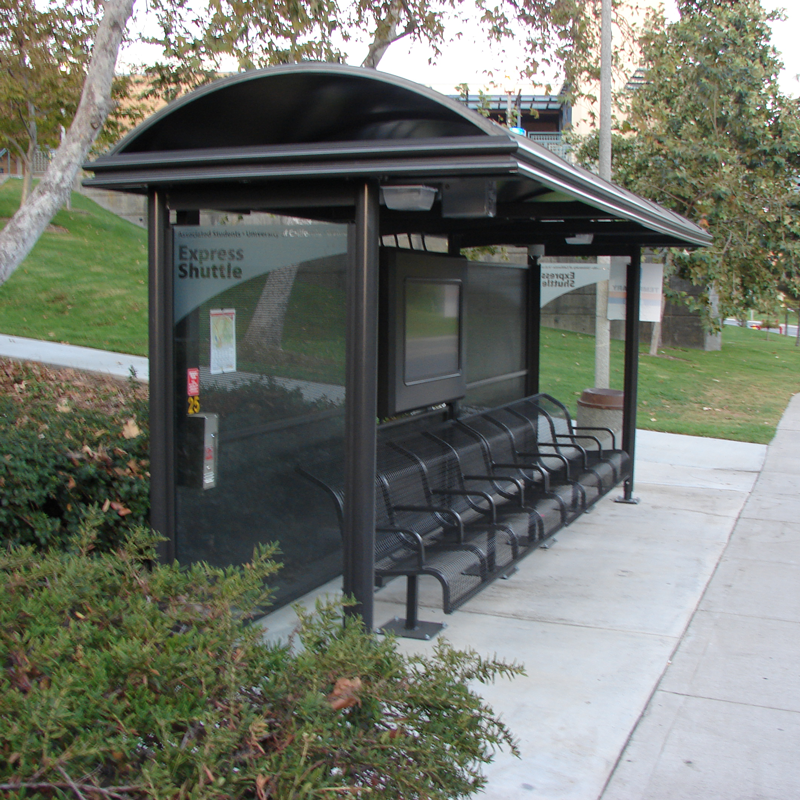 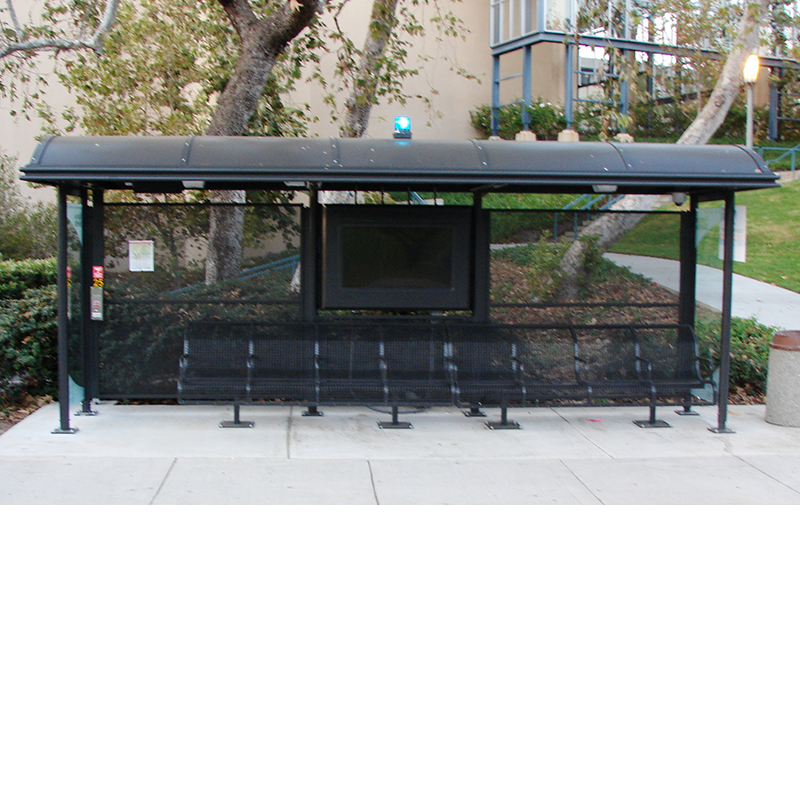 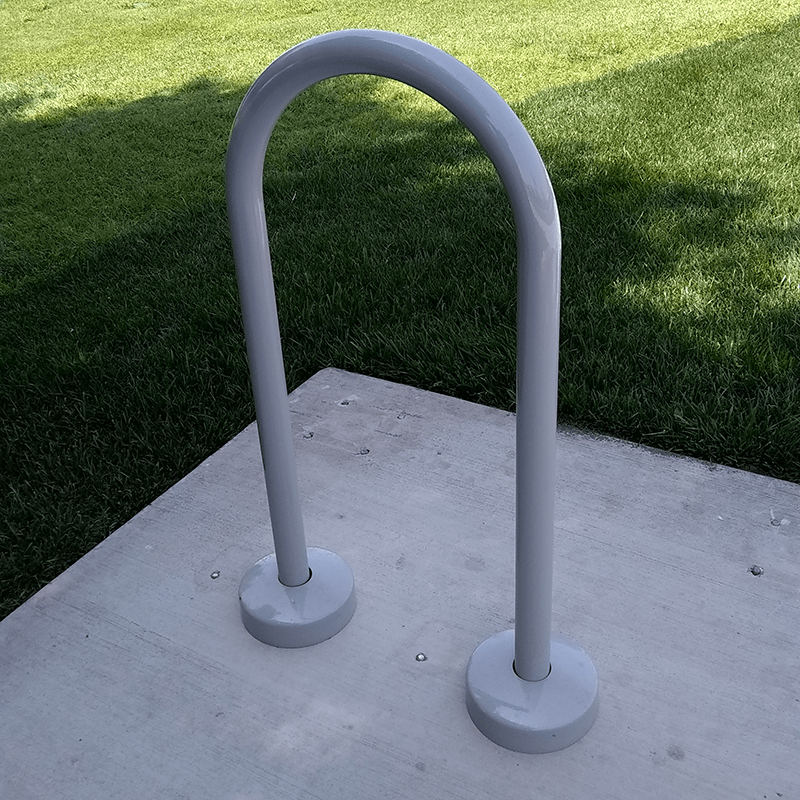 Your SmartPlace™ transit shelter is here. 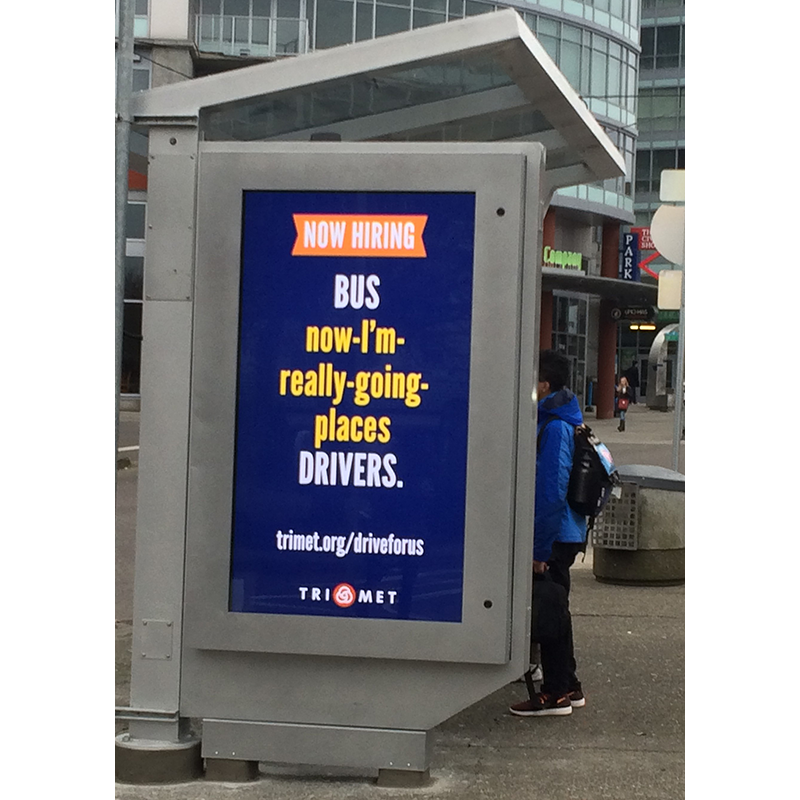 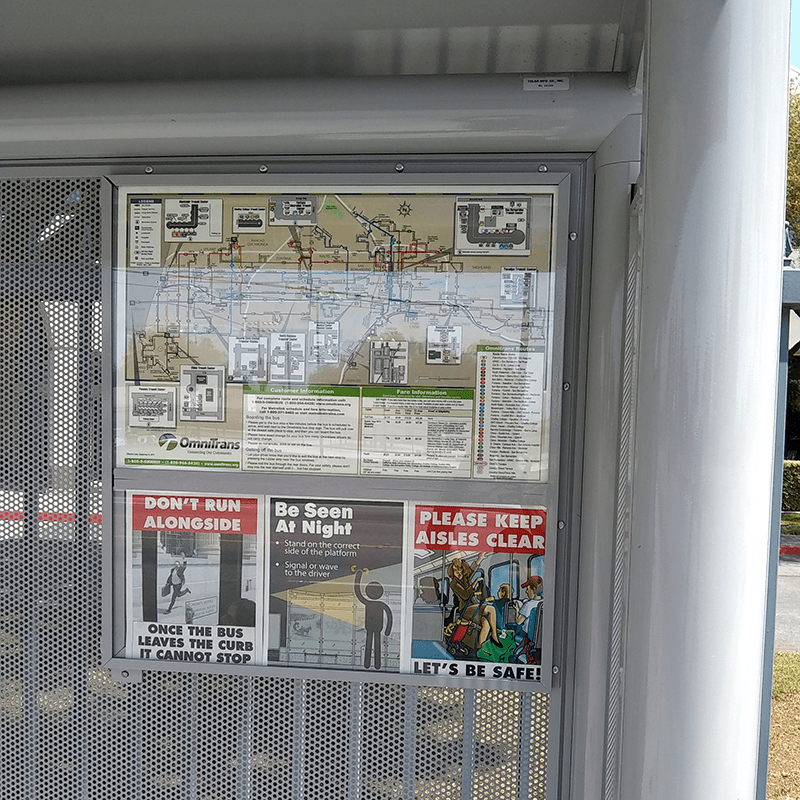 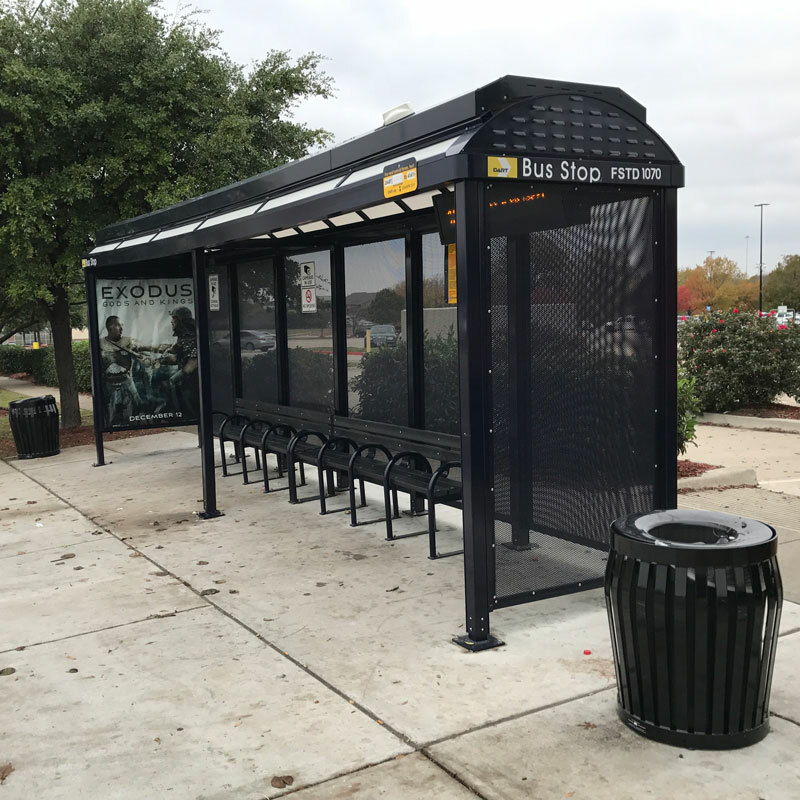 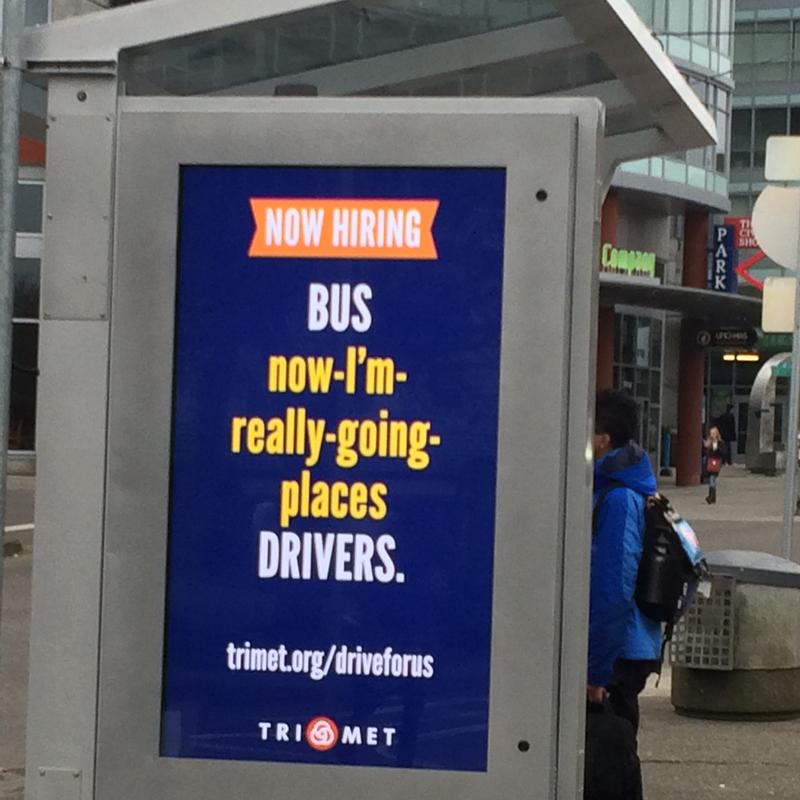 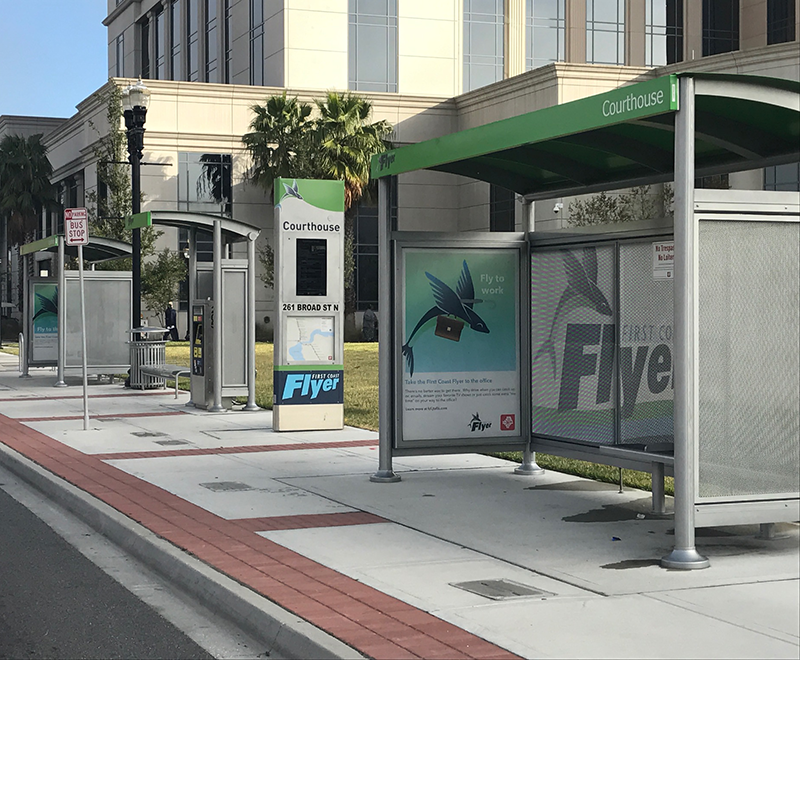 Providing timely and accurate information directly at bus and rail stops is key to boosting rider confidence, according to multiple transit agency surveys. 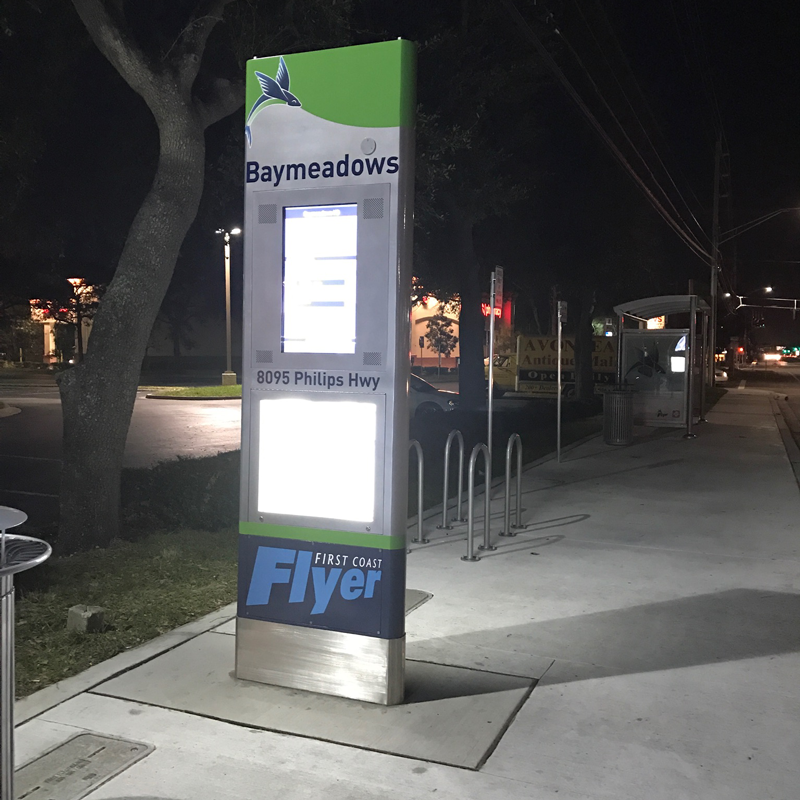 Delivering accurate, real-time information directly at the stop to support information on the rider’s mobile device is quickly becoming the norm. 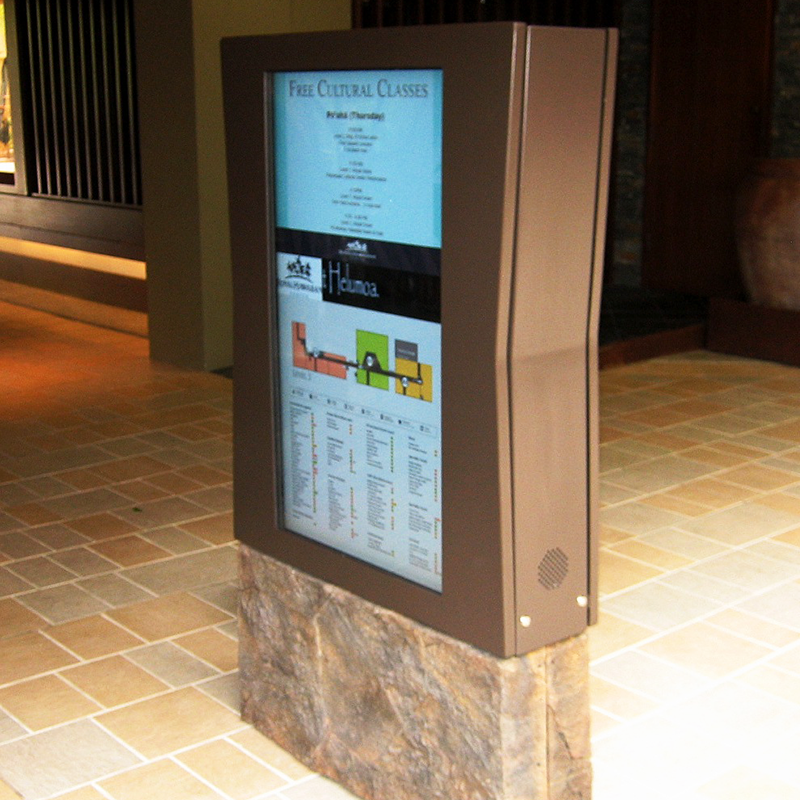 But, utilizing technology to deliver real-time information is only the tip of the iceberg. 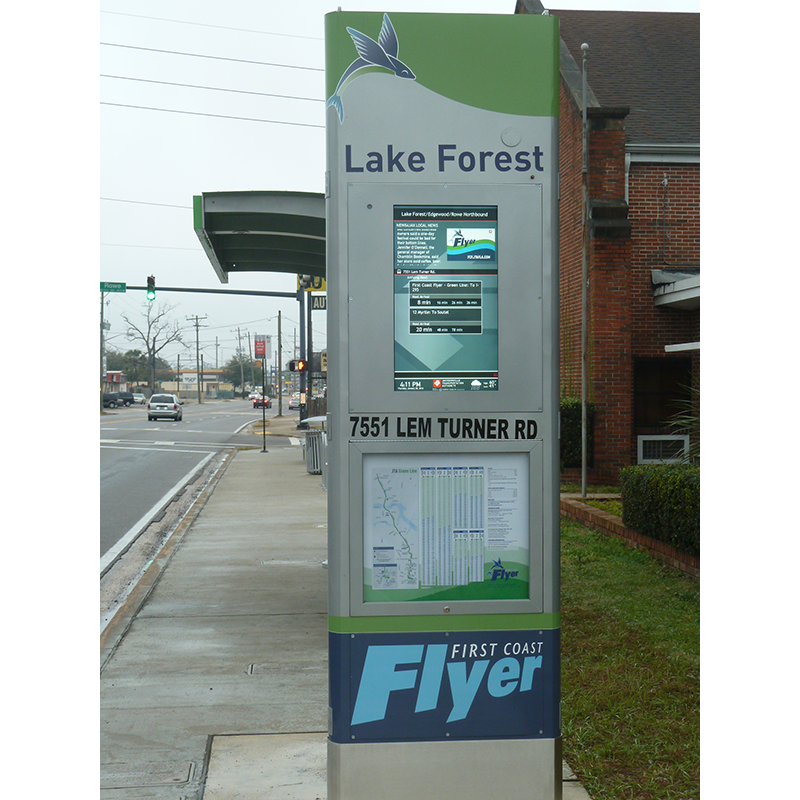 Tolar Manufacturing is leading the way in developing distinctive at-stop digital solutions that address growing passenger expectations, from real-time information housed in oversize displays and free-standing kiosks, to solar solutions for safety and security, digital advertising displays, charging stations, closed-caption cameras, emergency call boxes and more. 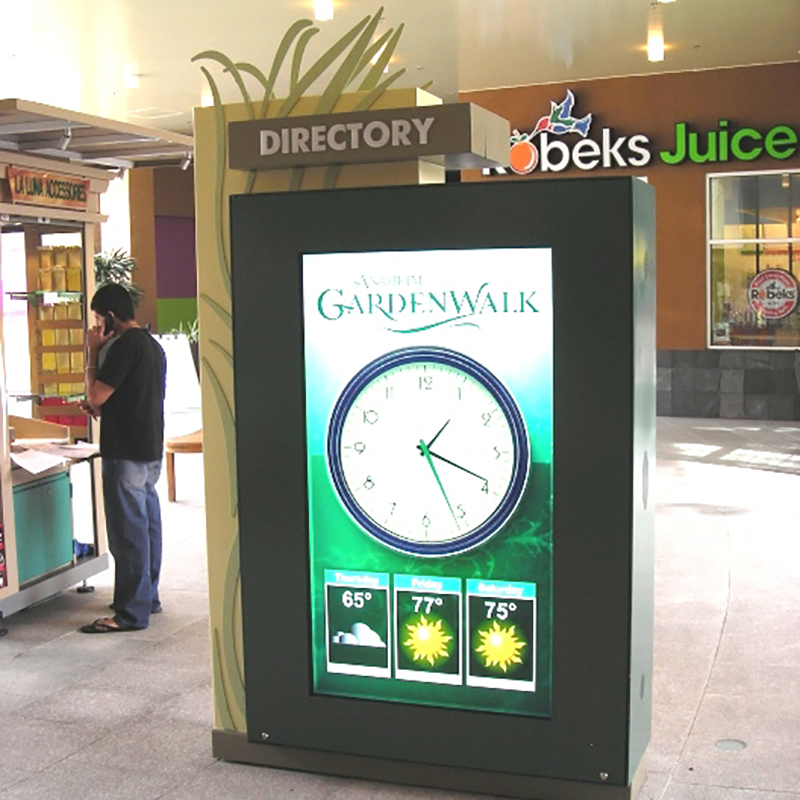 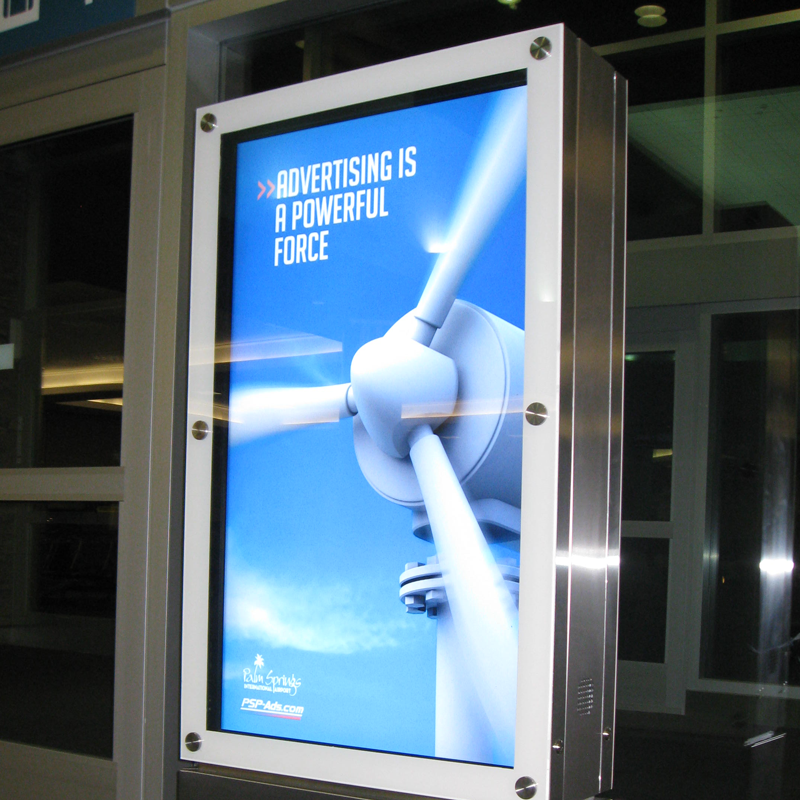 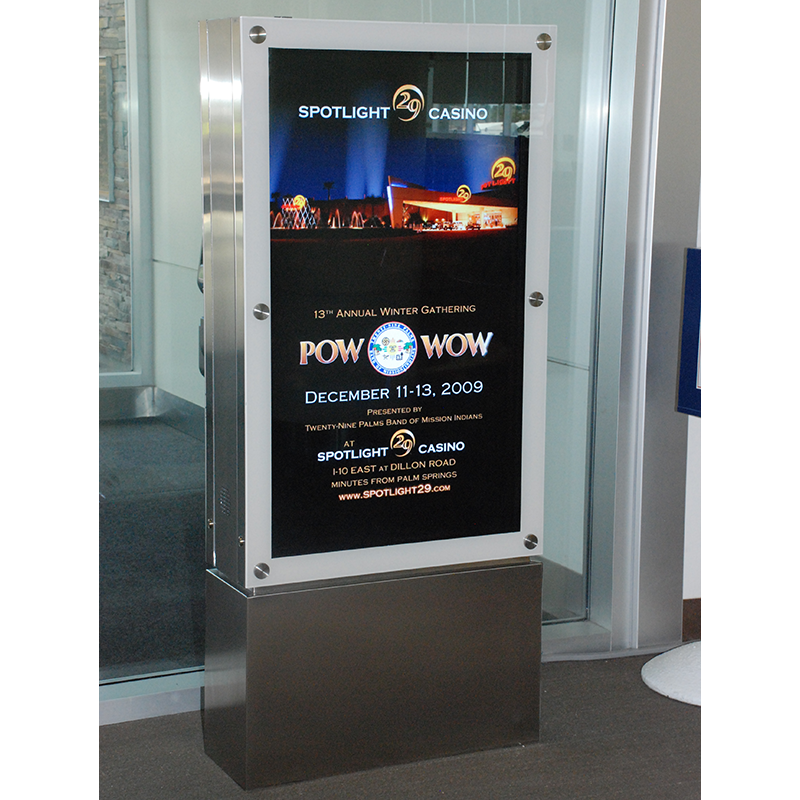 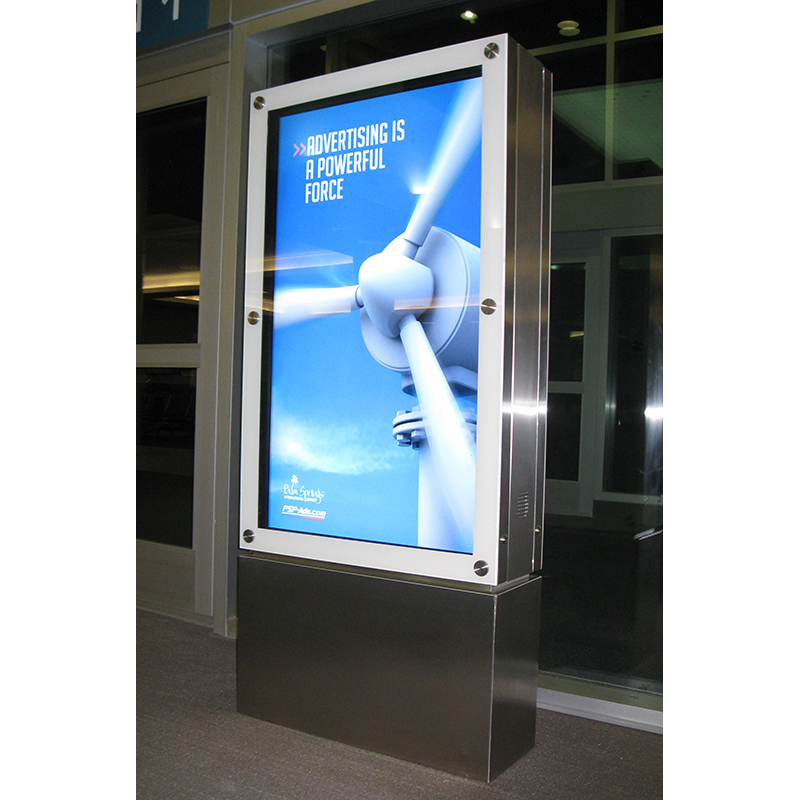 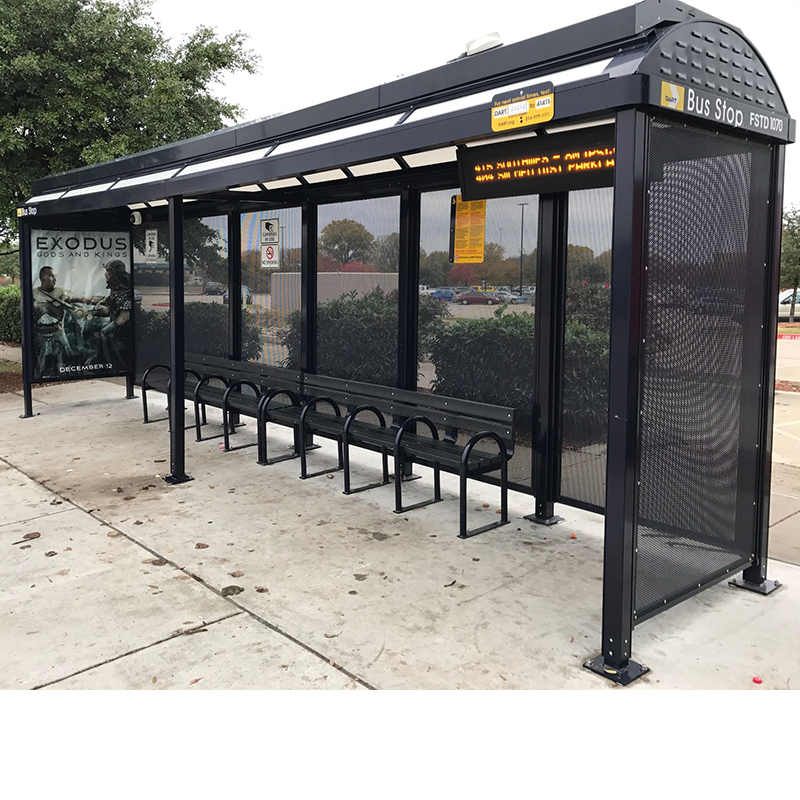 SmartPlace™ leverages Tolar Manufacturing’s 25 years of award-winning experience as the industry leader in the production of all-weather transit displays, kiosks and shelters with forward-thinking strategic partners working within the technology, digital and solar industries. 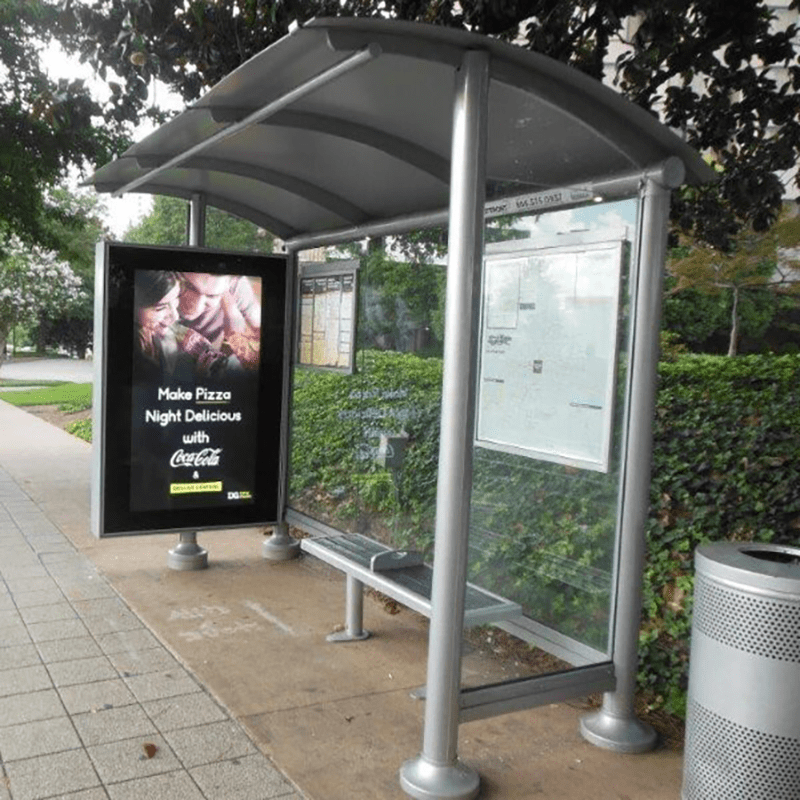 We are committed to continuing to work with agencies to bring more and better SmartPlace™ digital bus stop solutions to communities through out North America. 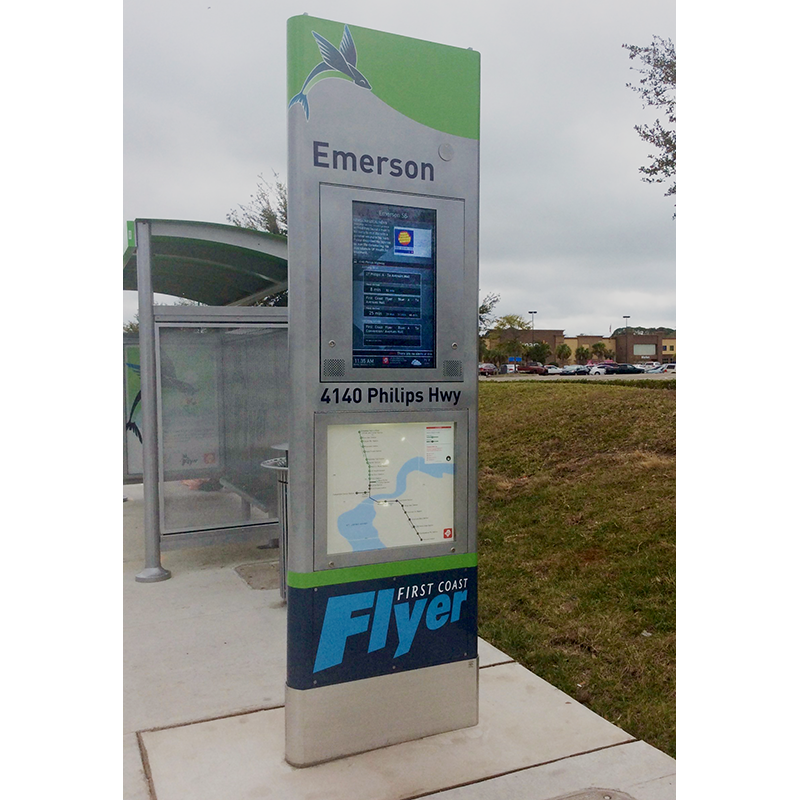 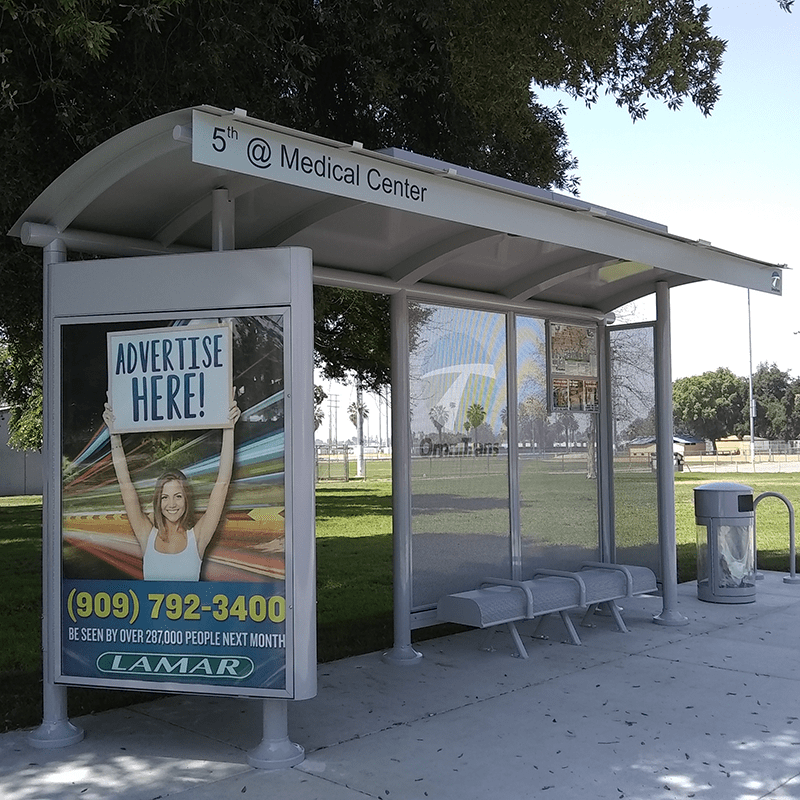 Pairing our diverse transit shelter design portfolio with customized branding and cutting-edge technology allows Tolar to create a personalized Sense of Place™ that improves passenger confidence and supports increased use of public transportation in the communities it serves. 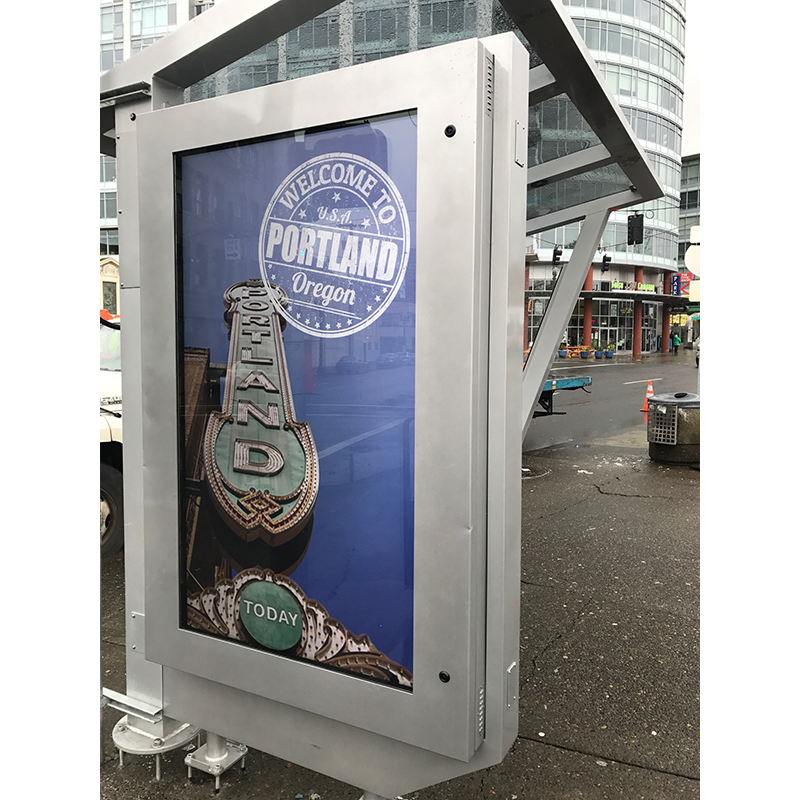 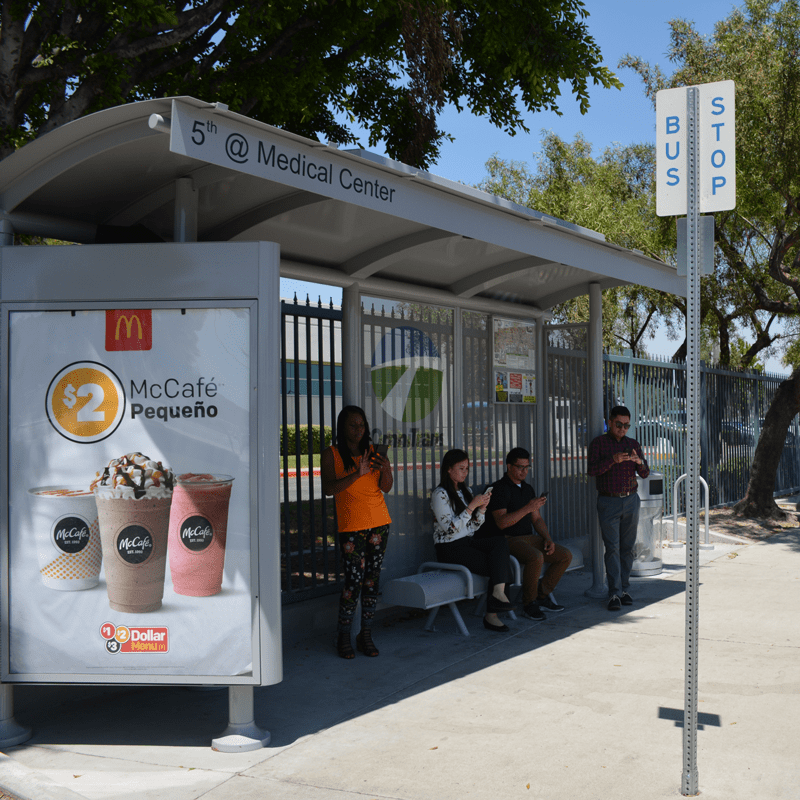 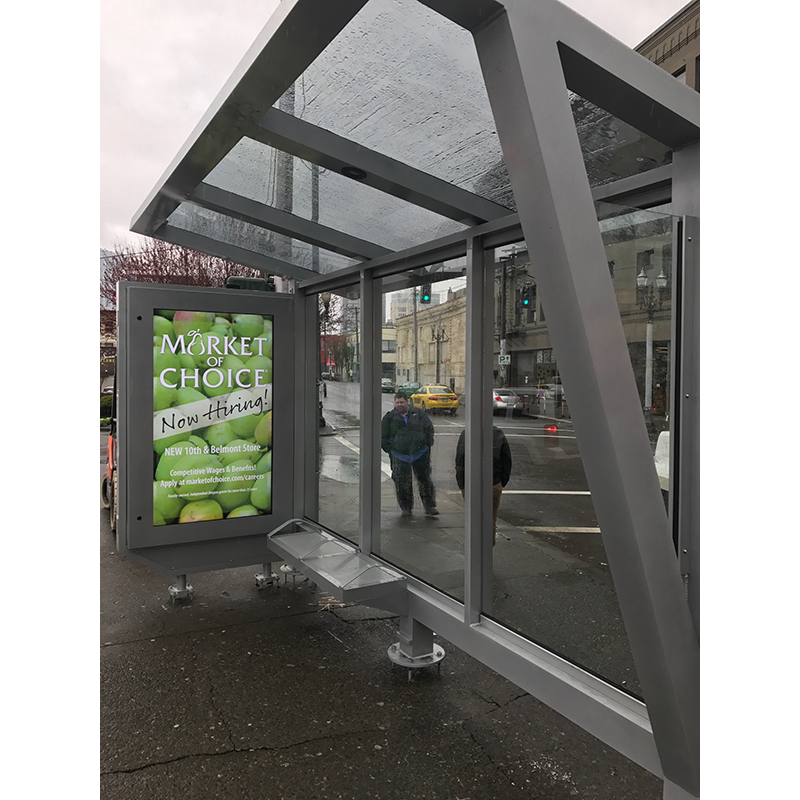 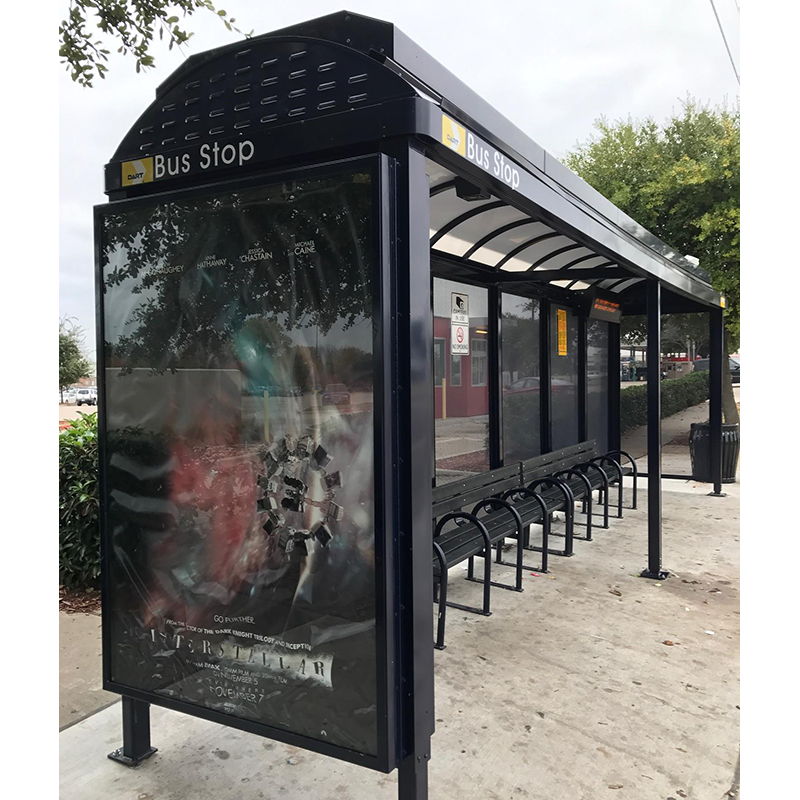 10-ft Signature Sunset advertising transit shelter with radius roof, flat back-to-back digital advertising media display kiosk, dual map cases, escutcheon shoe covers, LED lighting, and aluminum framed recycled slat bench. 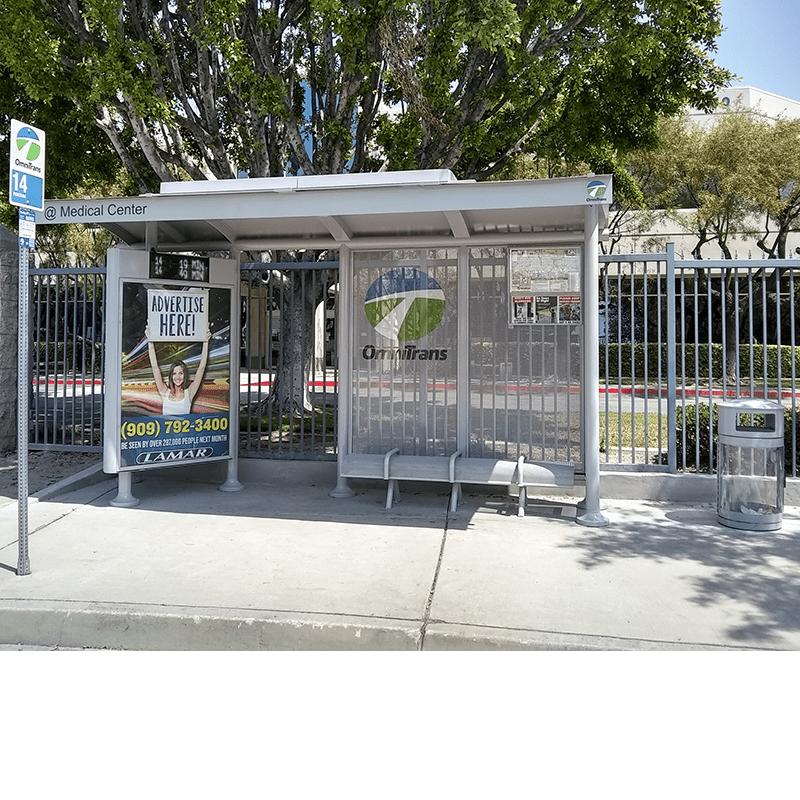 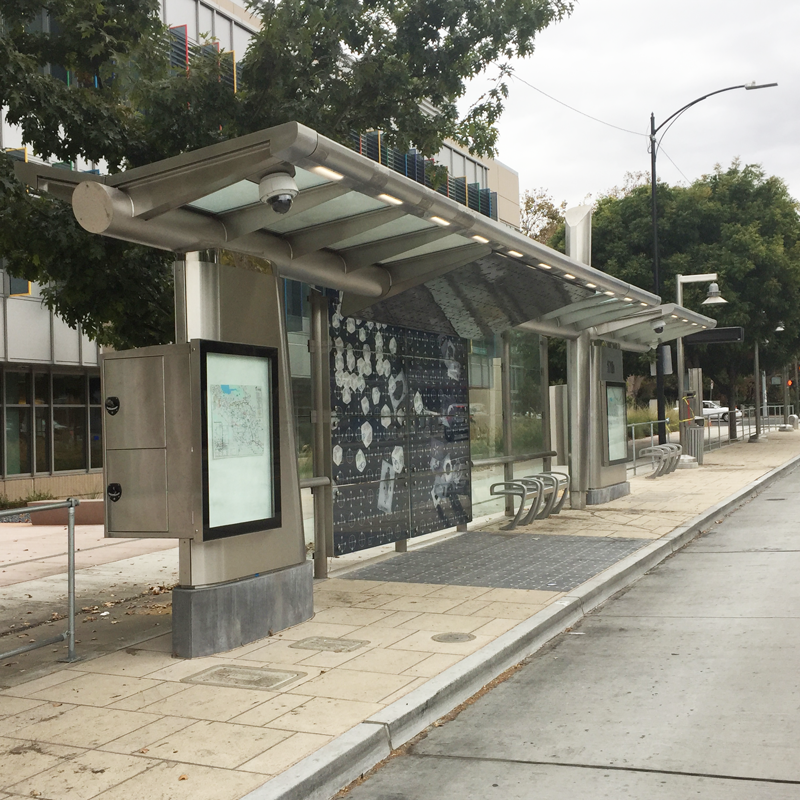 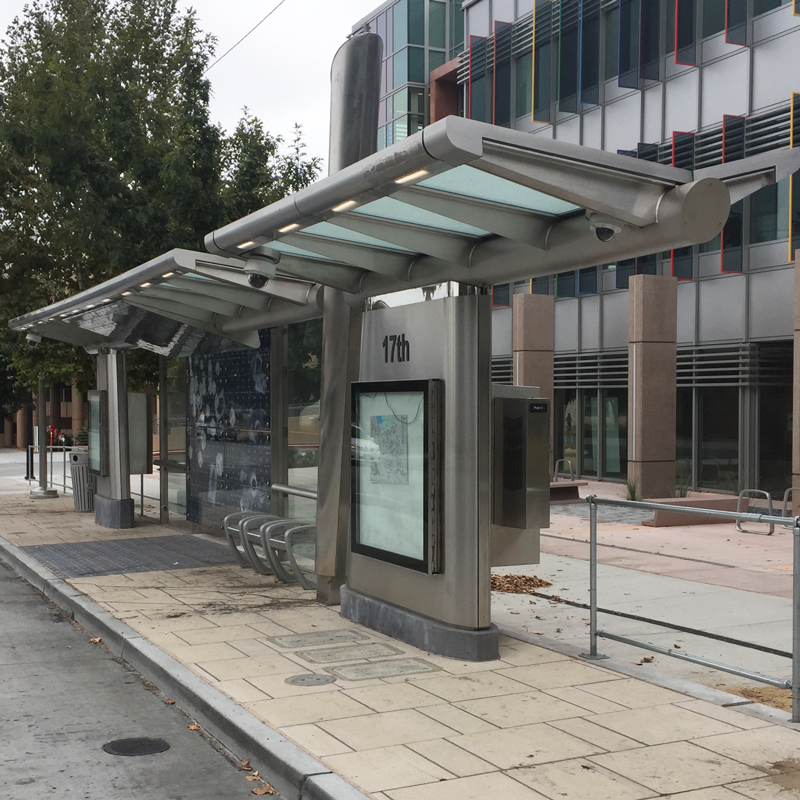 48’ Signature BRT stainless steel SmartPlace™ transit shelter for VTA in San Jose (CA) including equipment display cabinets, glass roof, art elements and protective railings. 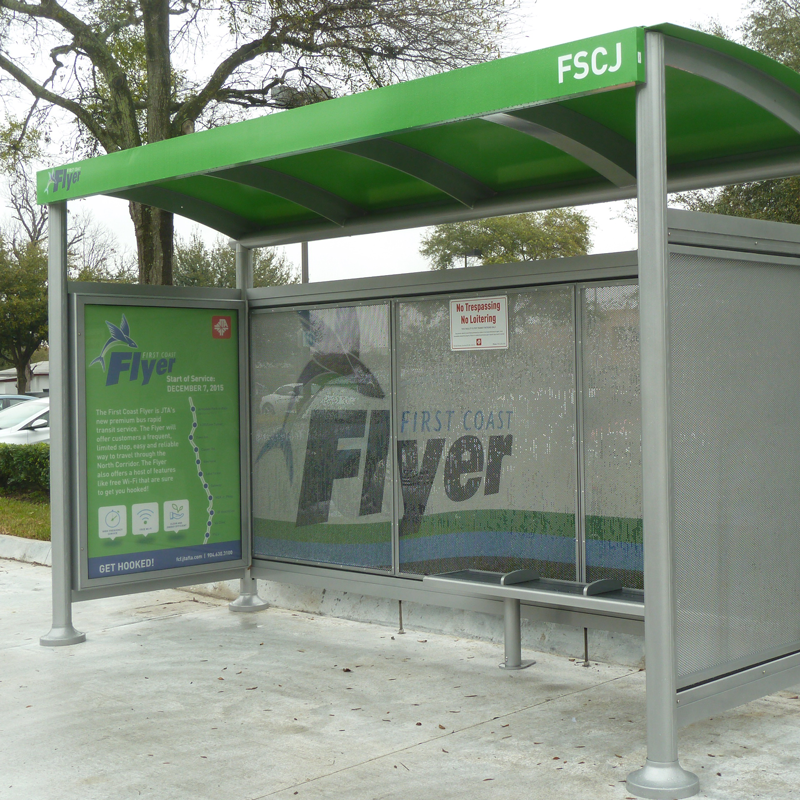 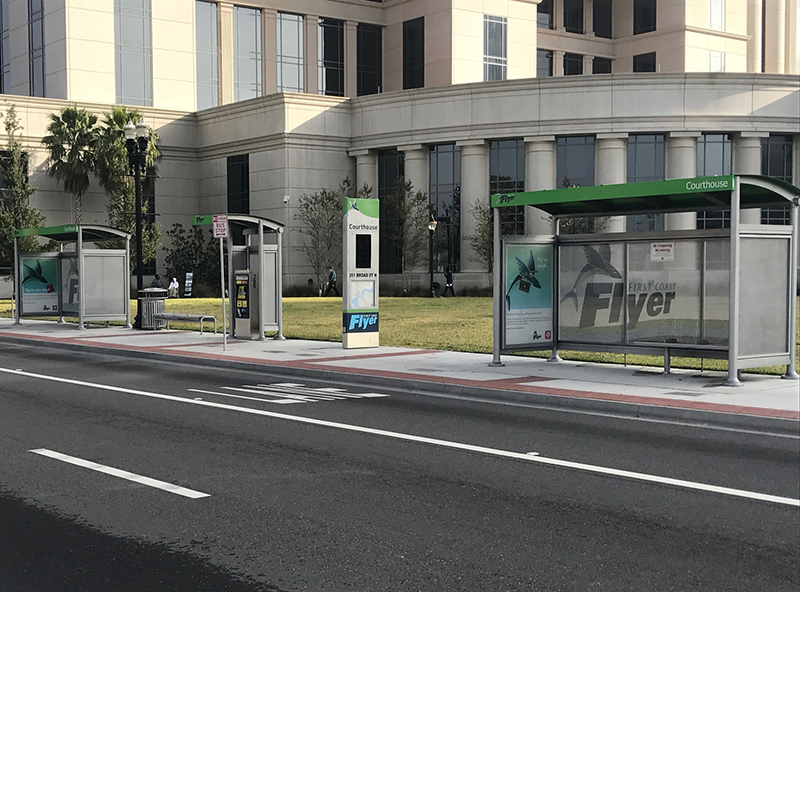 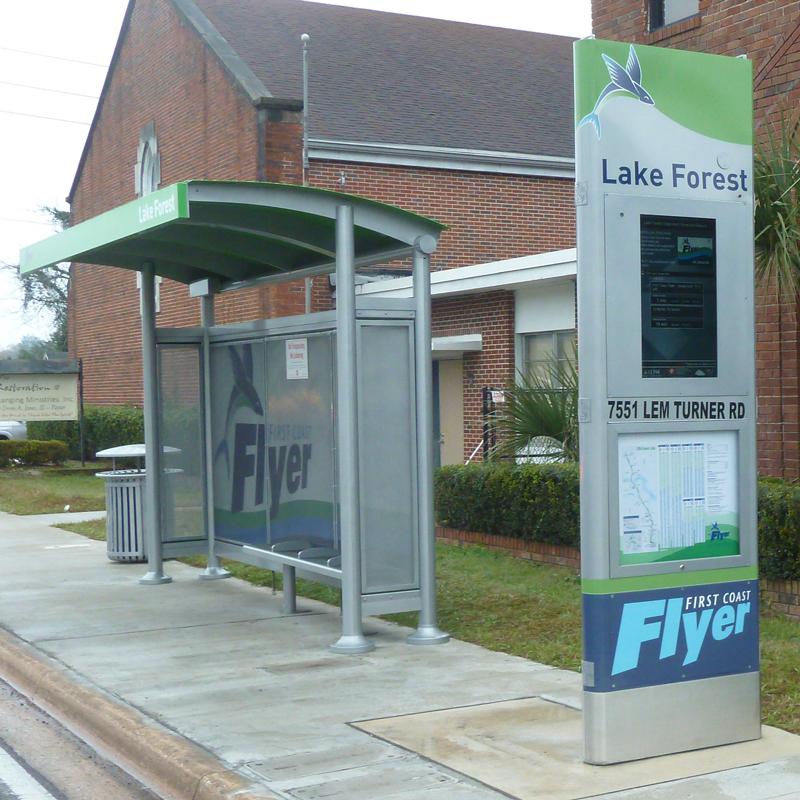 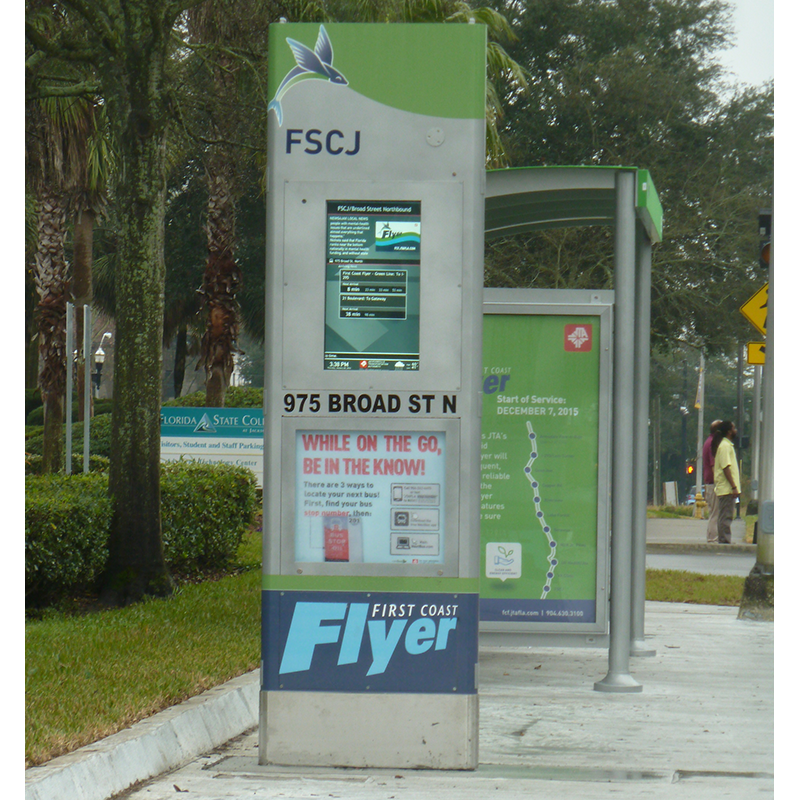 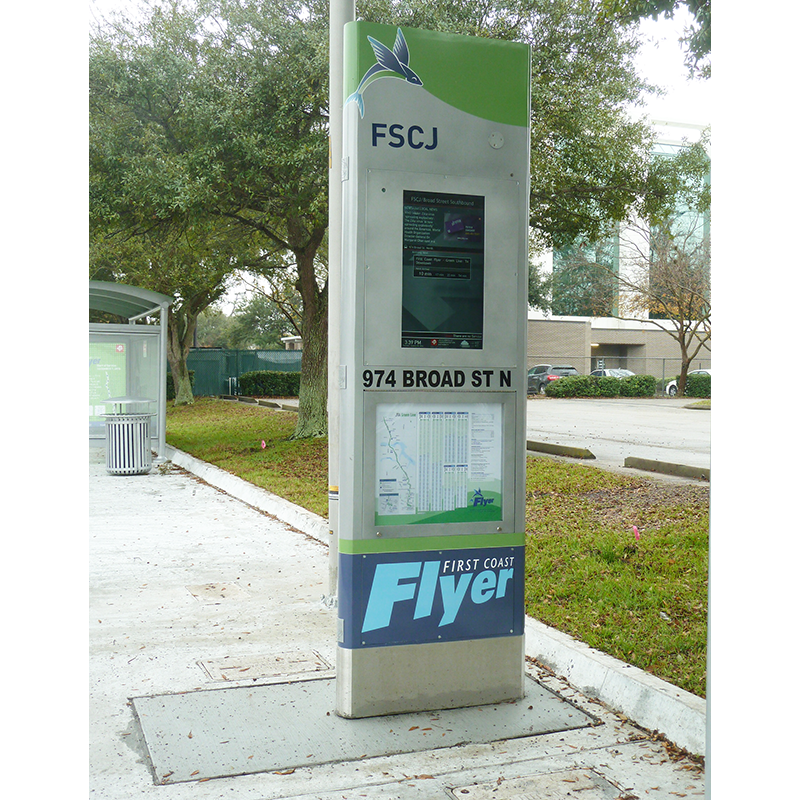 15’ Signature BRT First Coast Flyer shelters with aluminum roof panels, flat back to back media display kiosk, custom branding over perforated metal panels for JTA in Jacksonville (FL). 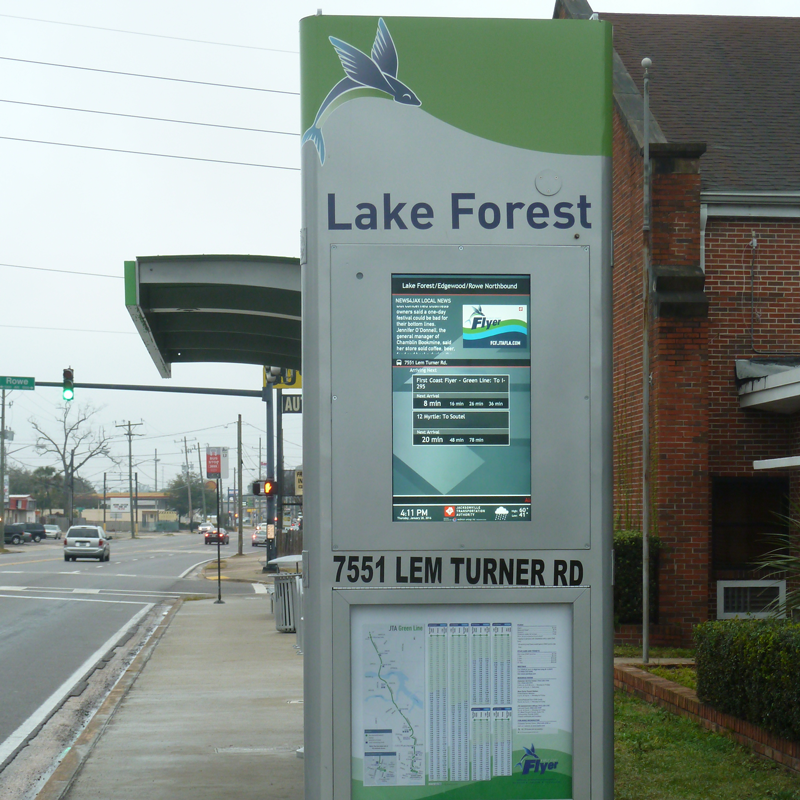 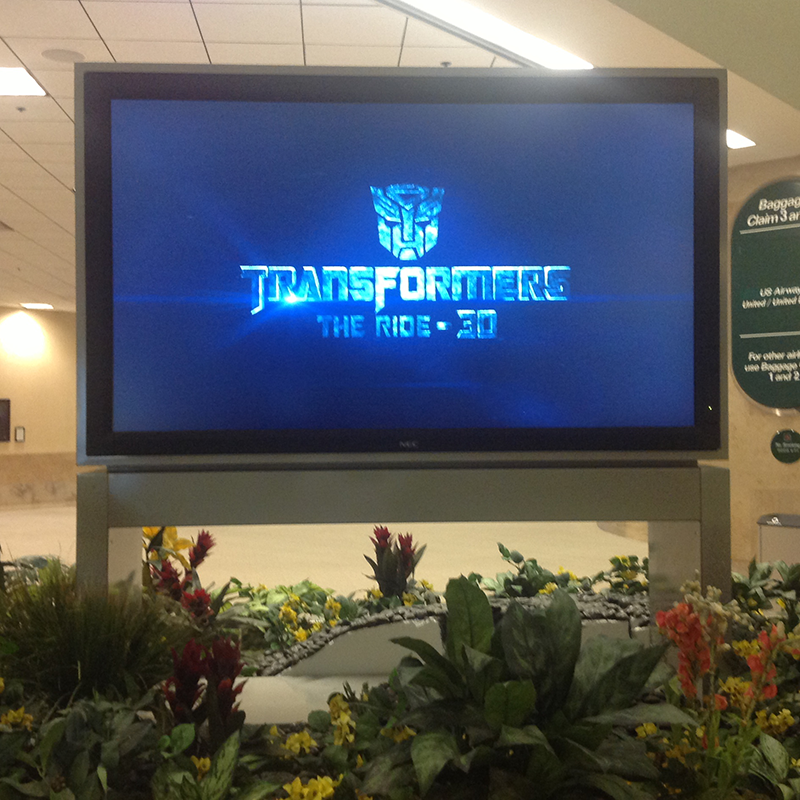 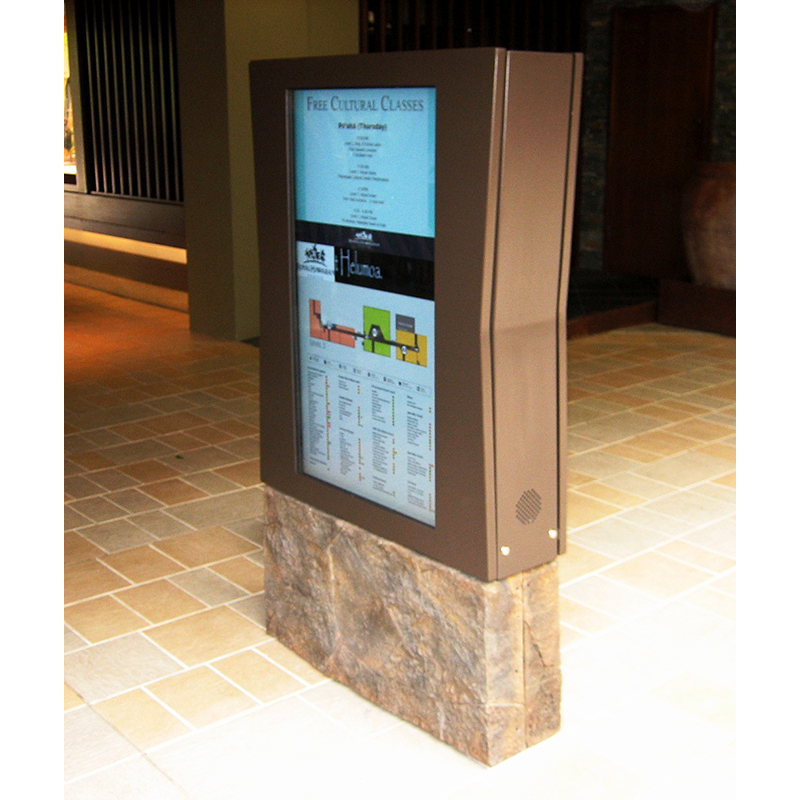 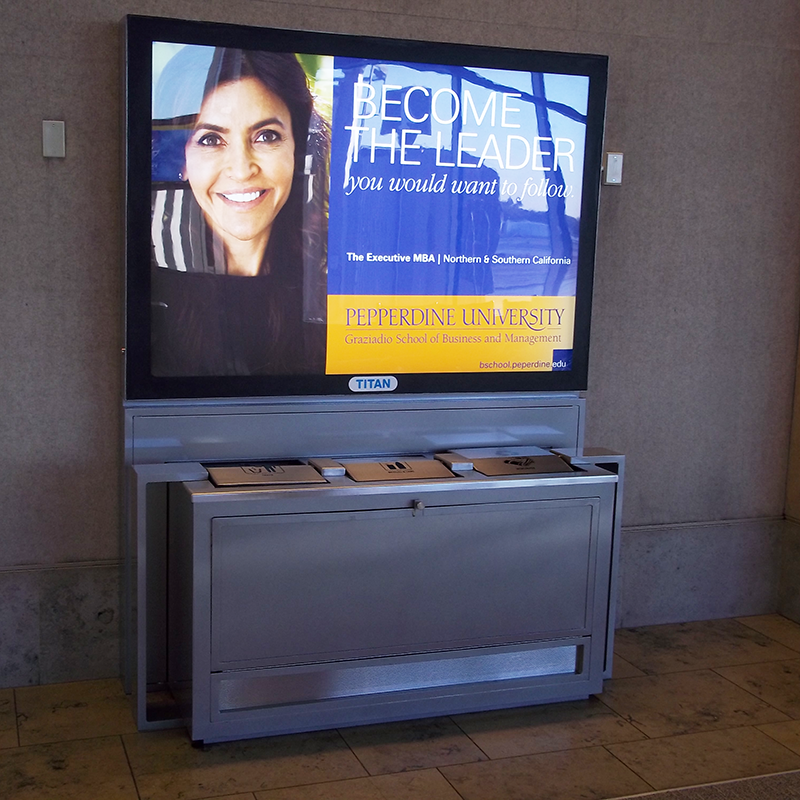 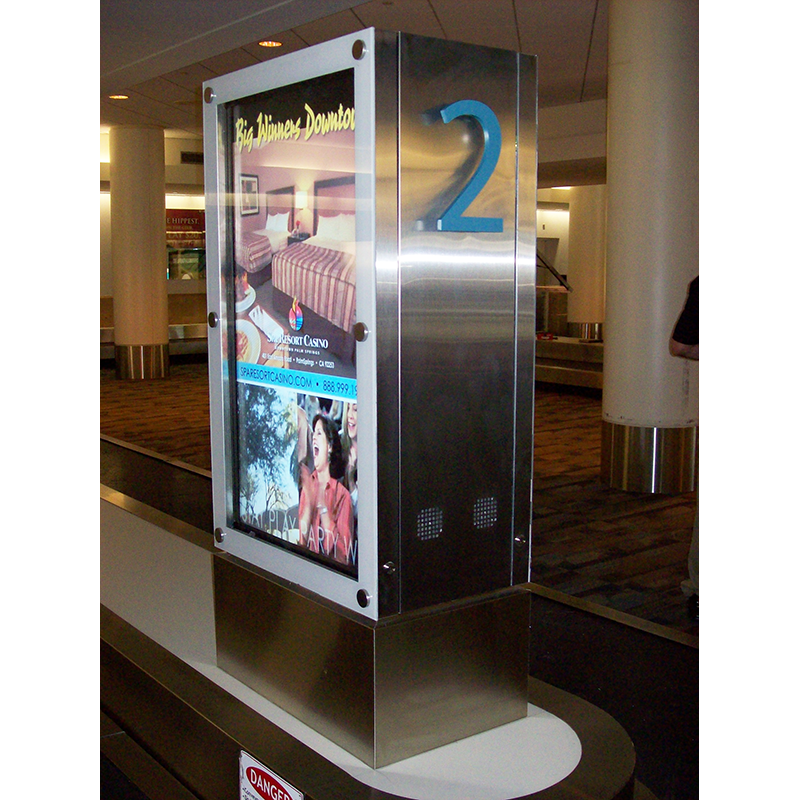 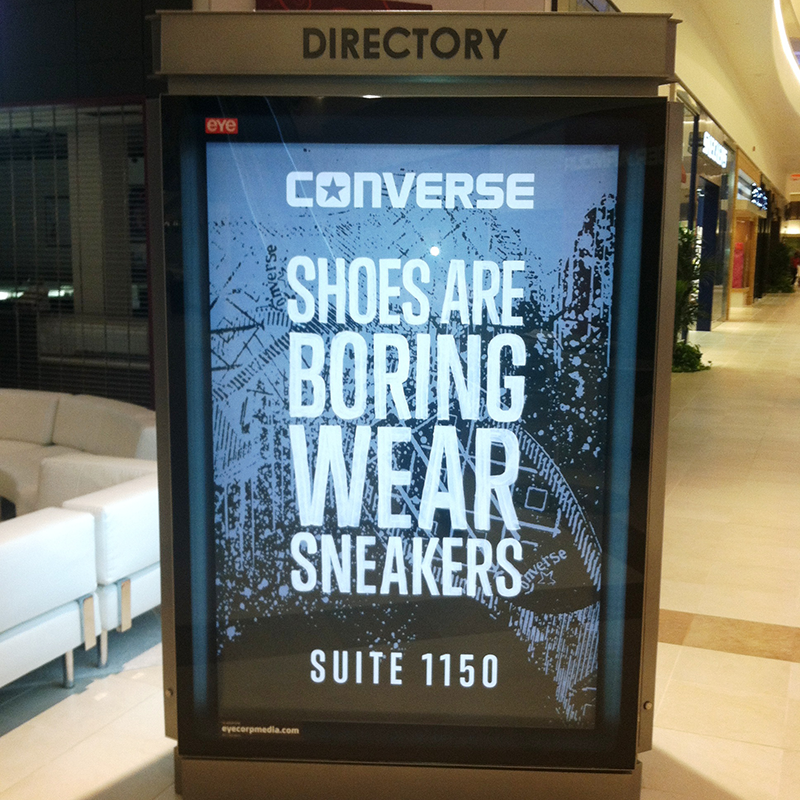 Project also included 10′ Digital Display Kiosks with 32″ back-to-back LCD digital screens in NEMA-rated enclosures with back lit LED map cases placed below digital screen. 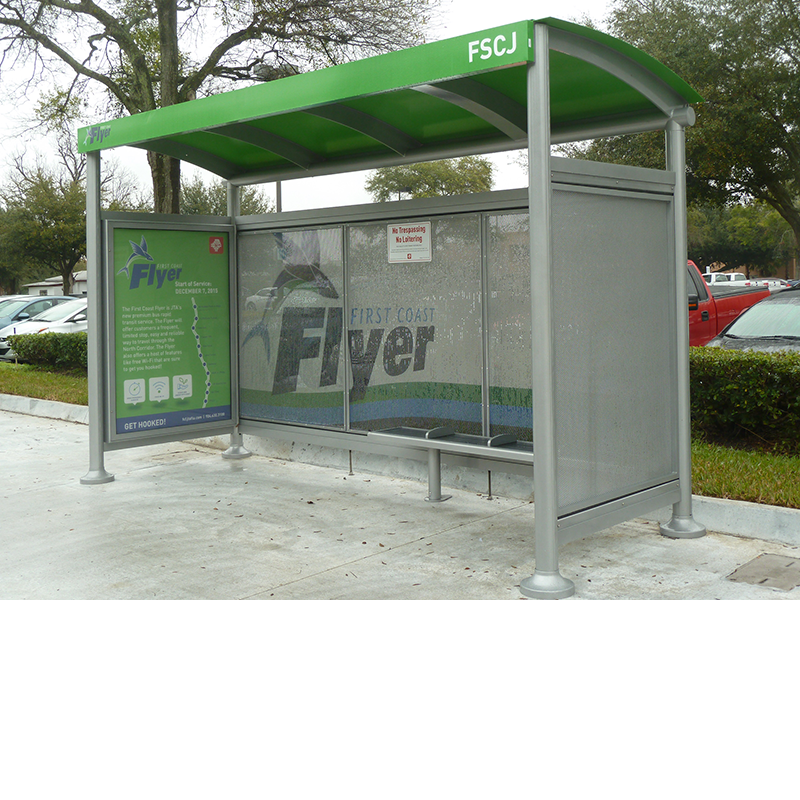 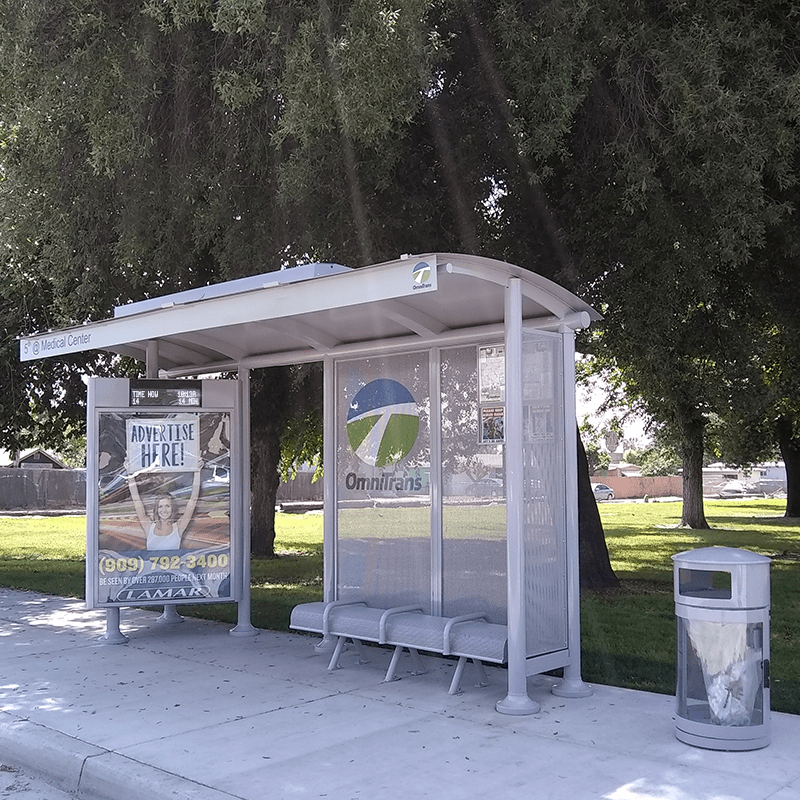 26′ Sierra dome roof SmartPlace™ transit shelter with bronze lexan roof panels, perforated metal rear walls, and branded end walls. 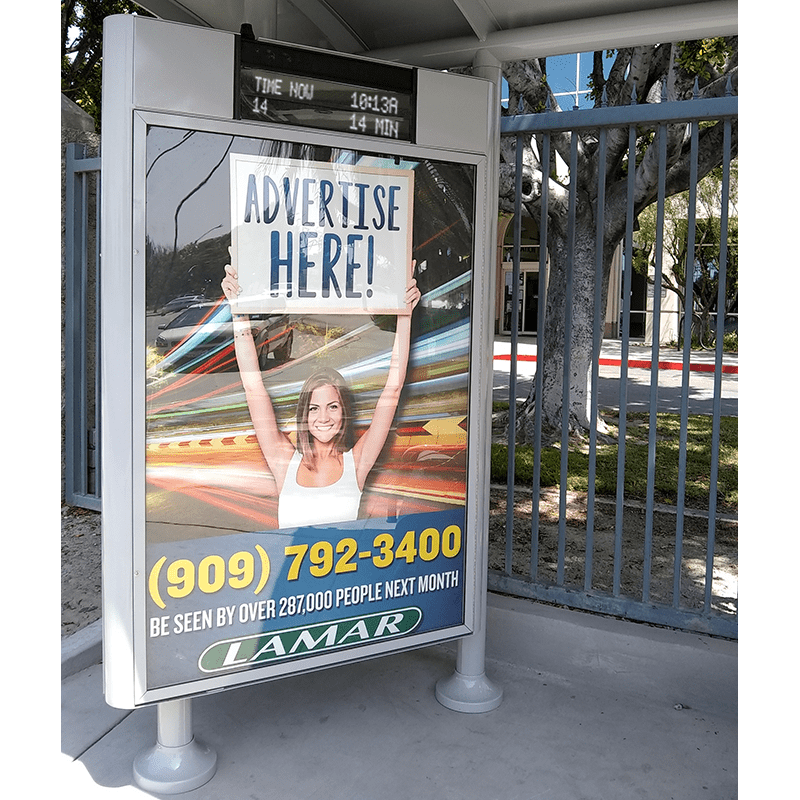 Complete with LCD TV wireless access, emergency call box with notice beacon, closed-caption camera, and wire grid contour bench with back.